A joint operation conducted by the British and German police as well as the Europol yielded the arrest of a person suspected to be the culprit behind the theft of millions of Euros in IOTA currency. The suspect, a British male in his mid-thirties is set to be charged on counts of fraud, money laundering and theft. The arrest is a result of months of investigations that was instigated by the theft of €10 million in IOTA currency from over 85 people, many around the German city of Hessen, beginning in January 2018. 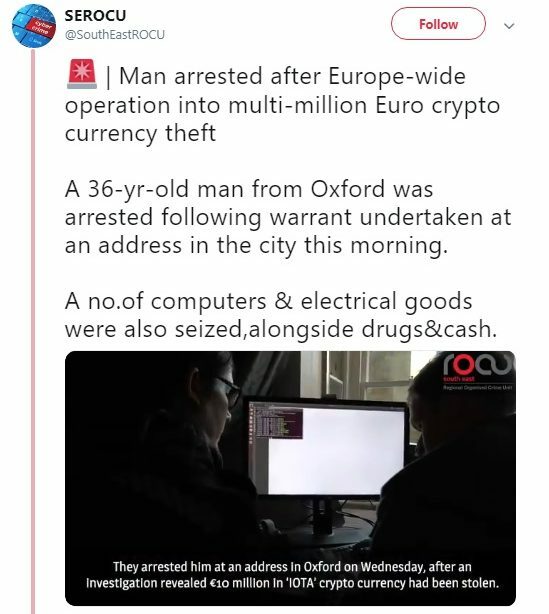 The arrest was made in the town of Oxford, UK where the suspect was taken into custody by the local police and a unit of the South East Regional Organized Crimes Unit. The suspect under the pseudonym ‘Norbertvdberg’ advertised an online seed generator, iotaseed.io which could be used by IOTA users to generate the 81-digit seed. The generator’s code was even linked to a GitHub repository that lent credibility to its apparent purpose. However, unbeknownst to the users, the suspect’s seed generator would store such info which the suspect then used to withdraw money from dozens of digital wallets and transfer to other wallets under fake IDs. In a press release, the Europol also reported the confiscation of several electronic devices that contained clues and evidence of the hacker’s involvement in the aforementioned theft. It also seems likely that the suspect may be extradited to Germany to face trial for the theft of millions he siphoned from many IOTA users around Hessen, Germany. As commendable as the multinational investigative work was, the apprehension of the suspect behind the theft of millions of digital currency will do little to improve public and investor confidence in the safety and security of digital currencies. The IOTA episode wasn’t a standalone one and is just one of the many hacking episodes the cryptocurrency industry has seen over the past year or so. Just this month, the New Zealand based exchange Cryptopia was the target of a hack and theft that costs millions. There have been cases where stolen user data have been found to be advertised and sold online for money as well. In fact, security experts have claimed that $2.5 million is stolen from exchanges around the world on a daily basis.